"I am familiar, of course, with this prestige audiophile label from Japan, but only own two of their recordings: Midnight Sugar and Girl Talk. Both are famous superb recordings, and offer amazing audiophile sound and performances of top notch jazz arrangements. They have been reissued often by TBM and other companies, worldwide. That said, Greensleeves has never been reissued on LP by anyone, anywhere! Maybe Greensleeves was just too exciting, too bold, too dynamic, too melodic, too unusual to include a Hammond B3 organ, or maybe just ALL of the above!" "I cannot understand how [Chris] Bellman got 100% of the dynamics, power, subterranean deep powerful bass, delicate guitar, bass riffs, and drums all on a 33 RPM release without the instruments colliding into one another. I am shocked by the RTI pressing of such utter quiet and explosive punch... harmonics and layered realistic textures lived in the room as the needle found its groove. Imaging is pin-point stable and precise, and dynamics never overload." "If this is not the ultimate audiophile demonstration LP released this year, then none will be released. I dare you to stop listening to this LP once the first cut has commenced! With mostly standards jazzed up for the brilliant musicians to love to play, I was constantly tapping my toes and reminiscing on when I first heard a certain melody. What great fun!" " ...Packaged by Impex in slick classy gloss and full color, Greensleeves is a high-quality production for a top jazz collection. Prediction: this release will triple in price! For those smart enough to buy multiple copies and put extras away, a bonus awaits them! This is the best audiophile system demonstration LP I have heard in ages, and a must-own. Thank you Impex! Greensleeves receives my highest BUY recommendation!" - Robert H. Levi, positive-feedback.com, Read the entire review! 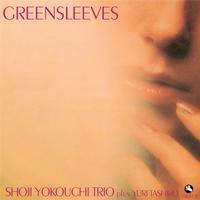 On Shoji Yokouchi's Greensleeves, standards, original tunes, and the title track are interpreted in breezy and surprisingly soulful ways. The ace guitarist is given immeasurable support by his band and guest organist Yuri Tashiro. Her playing is moody, fiery and funky: often at the same time! Impex's Limited Edition vinyl reissue preserves the original's clear, pristine sound (check out the bass on Yuri's organ!) while improving surface noise and definition. This rare gem of Tee Fujii's repertoire is another entertaining listen for TBM fans from Impex Records! Audiophiles can celebrate with this great 1978 reissue on Three Blind Mice, the Japanese label. This is a terrific session. I'm not familiar with any of the musicians but they're truly a talented bunch. Anyone fearing this is just an audiophile disc with no substance need not worry. This is the real thing. The sound is as clear and palpable as I've ever heard on vinyl. The soundstaging is to die for. A particular standout for me is Yuri Tashiro on the Hammond organ- just the right touch.